The commencement of Interstate Women’s competition is unclear but is thought to have started in 1912. However the first recognized championships occurred in 1920 when the Interstate Women’s Four Championship was conducted in conjunction with the Interstate Men’s Championships. The Australian Women’s Rowing Council was also established at these Championships. It is worth noting that the Australian Amateur Rowing Council was not formed until 1927. The 1920 Interstate Women’s Four Championship was won by South Australia represented by a Mannum Rowing Club crew stroked by Dorothy Arnold. The United Licensed Victuallers Association (ULVA) of Queensland presented to the Australian Women’s Rowing Council this unique sterling silver trophy. 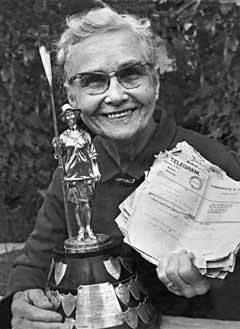 The trophy was crafted by London silversmiths to depict Dorothy Arnold, the petite girl from Mannum who stroked the winning crew. She is holding her oar and dressed in the rowing garb of her time, namely a floppy hat, sailor top and billowing bloomers. The trophy is inscribed with the following words: Interstate Ladies Four-Oared Championship Trophy Presented by Queensland Licensed Victuallers Association E H Ruddle Esq. President 1920. The trophy is affectionately known to Australian oarswomen as Bertha. However in 1941, on the motion of NSW, the Australian Womens Rowing Council resolved to drop the name Bertha and that it be officially known as the ULVA Trophy. This change occurred only officially with the name Bertha still used by oarswomen. In 1958, there was a brief discussion at the Australian Womens Rowing Council about the outmoded appearance of the trophy. Fortunately the majority of members disapproved of any alteration to moderise the dress of the model of the trophy. In 2003, the trophy became officially known as the Queen Elizabeth II Trophy, or the Queens Cup. The original ULVA trophy remains the perpetual trophy. There was an interesting lead up to the allocation of Queens Cup to the women's eight oared Championship with the Queens Cup originally being destined for an international schoolboy regatta. In 1993, Brisbane Boys' College raced Eton in the final of the Princess Elizabeth Cup at Henley and won. This was the first time that an Australian Schoolboy Crew had won this prestigious event. In 1997 Simon Newcomb approached Dr Steve Hinchy (President of Rowing Australia) and asked for permission to approach Buckingham Palace and the Queen's Private Secretary Sir Robert Fellowes as to whether Her Majesty Queen Elizabeth ll would be prepared to provide a trophy to be known as the Queen's Cup for an annual International Schoolboy Race. The first race should take place to coincide with the centenary of Brisbane Boy's College in 2002. I refer to your letter of 19th April 1999 to the official Secretary requesting Her Majesty The Queen's consent to donate a perpetual trophy for an annual International schoolboy rowing event to be held in Australia. The Official Secretary has recently received formal advice that her majesty has consented to a Royal trophy to be called 'The Queen Elizabeth Cup' to be raced for in Australia by schoolboy crews from all over the world on an annual basis. Her Majesty is content for the first event to be held in Brisbane to coincide with the centenary celebrations of the Brisbane Boys' College in 2002. Rowing Australia subsequently determined that the trophy would be best allocated to the women's eight event to provide some equity of regal trophies for men's and women's interstate eight oared championships and thus provide synergy with the Kings Cup. In early 2001 approaches were made by Rowing Australia to the Governor General to have the trophy changed from an International Schoolboy Race to the Women's Interstate Eight Oared Championship. The Queen provided her consent to this change which occurred in 2003. 1 Great Britain won the 1938 race but was rowing by invitation so the title went to Tasmania. 2 New Zealand won the 1966 race but was rowing by invitation and so the title went to Victoria. 3 The Victorian crew was withdrawn from racing in 1976 by the Victorian Ladies' Rowing Association.